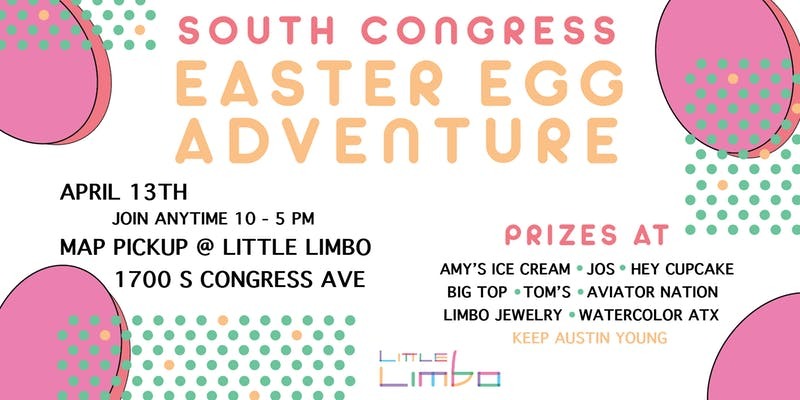 Little Limbo & Keep Austin Young have partnered to bring your family a South Congress Easter Egg Hunt! Little Limbo is having it’s first ever Easter Hunt & you are invited! This South Congress adventure will begin at Little Limbo where you will pick up your hand painted map created by Watercolor ATX including each participating business. This hunt has you and your kiddos going along different shops on South Congress, bunny hopping and dancing like a duck to earn your earn your Easter Eggs. At the end of your adventure and the accomplishment of each task, your family will meet back at Little Limbo for a grand prize! We encourage everyone to show up in their bunny ears & bring their baskets with faces ready to be painted! Select stores will have promotions running this day only for map holders. Can’t wait to hop into this adventure with you! The ticket price is $5 per particpating child and each child will recieve the grand prize at the end. Each family will recieve a map that allows for the promotions from buisnesses involved in the Egg Hunt Adventure.